In nine days I travel with a few friends from church to a Christian Peacemaker Teams delegation to Israel/Palestine. It’s not your typical tour of the Holy Lands–not by any stretch. It’s a trip to listen to stories of Palestinian and Israeli peacemakers, stand in solidarity with the oppressed, and to stand in the way of violence done to children trying to get to school or farmers trying to tend their centuries old family olive gardens. I’ve felt called to take this trip for some time. But, I’ve held back because I wanted consent from my partner and my children. So, last summer, I sat down with my family and I asked for their blessing. I wouldn’t go unless I had it. We talked about the risks, about why I felt called to do it, and about how long I’d be gone. And over the course of the next several weeks, my partner and children blessed my call to the Middle East. But they did more than just bless the trip–they actively contributed to the fundraising efforts. They helped with the silent auction, contributing artwork, music, and poetry to the event. They helped with set up and clean up from the event. They also–to my delight–have helped me prepare for the trip–taking trips to the thrift store to help me find clothing suitable for the climate and the culture, and helping me learn more about the country by reading maps with me. This is one of those times when I realize that my children are beginning to understand this concept of discipleship. It is taking me to places I never thought I’d go, and it’s shown them that risk is part of the journey we take when we walk with Jesus. This journey of discipleship does not mean that none of us aren’t concerned about this trip. They know there is risk involved. Which makes their consent and their blessing all the more powerful. As our children grow, they will learn that the stories of Jesus call us to risk, to stand up, and to be in places that stretch us. And, as parents, we model that. We model discipleship, just as Jesus modeled it. It’s going to look different for all of us in each of our contexts, but when our kids see us taking risks and standing up for others, it gives them courage to do the same. I don’t know what this trip to the Holy Lands will hold for me, but I know I’ll be changed by what I experience there. Lord knows my kids are already changed by blessing my journey. Blessed be all our children, who watch and walk with us, as we take this journey of discipleship. 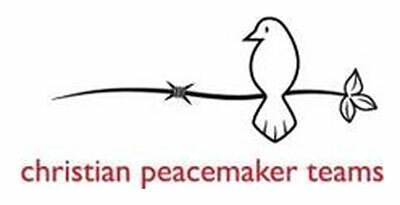 Tags: children, Christian Peacemaker Team, discipleship, family, Israel, Palestine, parenting, risks. Bookmark the permalink.